ecostore is committed to using certified sustainable palm oil as it is a healthier and safer alternative to petrochemicals and requires significantly less land than coconut for an equivalent yield. Our target is to achieve traceability back to the palm oil mills of our suppliers during the 2016-2017 calendar year. While we believe certified sustainable palm oil is the best option for now, we are also keeping a watching brief on alternative developments such as oil derived from algae. 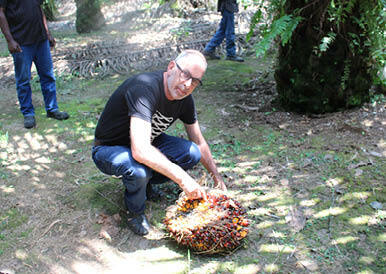 Our policy on sustainable palm oil can be read or downloaded here. 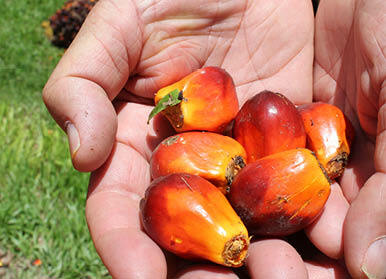 Palm oil is extracted from both the flesh and kernel of fruit from the oil palm tree. As well as being part of the diet of many people around the world, it can be found in a large number of every day supermarket products including processed foods, detergents and other cleaning products. Oil palms bear bunches of fruit year round that can weigh up to 50kg and are highly efficient oil producers, with each fruit containing about 50% oil. 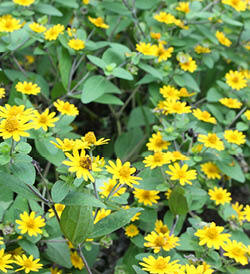 As a result they require up to ten times less land than other oil-producing crops. Increased global demand for palm oil has led to careless and large-scale destruction of forests and peat-swamps, threatening endangered and critically endangered species including the Sumatran orangutan, polluting air and waterways, worsening climate change and dispossessing indigenous peoples. The world's remaining orangutans can only be found in the rainforests of Borneo and Sumatra which are still being cleared to make way for palm oil plantations. This situation is not acceptable to ecostore and even though we are a small player in a large industry, we’re determined to be part of the solution. Some of our competitors have switched from palm oil to coconut oil, however this is not a long term solution as all viable plant‐based substitutes for palm oil including coconut have even greater environmental impacts, including higher contribution to global warming and significantly lower yield per square metre. The only reason these oils are not raising similar concerns to palm oil is because of the comparatively low volume being used. If everyone started to use coconut we would cause even worse environmental damage. While the Roundtable on Sustainable Palm Oil (RSPO) is working towards an increase in sustainable palm oil being used in the market, coconut oil does not have an equivalent body ensuring its sustainability. ecostore is committed to ensuring that our approach to sustainability builds and improves on the Roundtable on Sustainable Palm Oil (RSPO) certification, taking responsibility for managing our own supply chain by being fully engaged with our suppliers. It is important to achieve traceability of our palm oil supply chain back to the plantation source in order to ensure that we are using palm oil derivatives from plantations that meets both the RSPO requirements, and our principles for sustainability. New Britain is the largest island in the Bismarck Archipelago of Papua New Guinea. Getting there from New Zealand meant boarding progressively smaller planes in Brisbane and Port Moresby until we found ourselves on a tiny Air Niugini flight descending towards mountainous terrain covered in tropical rainforest. As we got closer we noticed a patchwork grid of oil palm plantations concentrated on the flatter coastal land around the town of Kimbe. 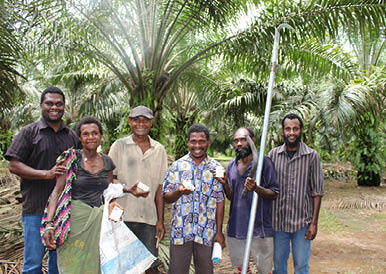 All palm oil produced in Papua New Guinea is certified sustainable under RSPO standard. From left to right: Malcolm Rands (ecostore CEO), Teup Goledu (NBPOL Company Secretary), Harry Brock (NBPOL General Manager). We were greeted at Hoskins airport by our host Harry Brock, the general manager of New Britain Palm Oil. NBPOL started as a joint venture between the Australian Colonial Administration of the Terriory of Papua and New Guinea and Harrison's & Crossfield, a British company, in 1967. 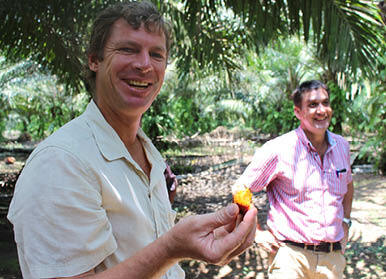 NBPOL are also members of the Tropical Rainforest Trust (TFT) and Palm Oil Innovators Group. Local schoolchildren with a sample of ecostore soap. NBPOL is vertically integrated, producing its own seed as well as planting, cultivating and harvesting its own nucleus plantation estates and processing and refining palm oil. Besides operating the nucleus estate, NBPOL provides assistance to smallholder growers through interest free loans to purchase seedlings and an active extension service providing guidance and support. 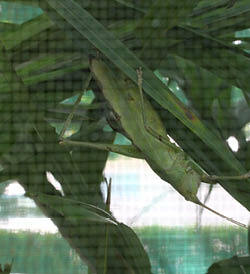 Insect predators are bred at a nearby Entomology unit to help control oil palm pests meaning no insecticides are needed. Although the oil palms are not grown organically, we saw very little evidence of chemical sprays other than roundup, which is used to clear a 2 metre circle of land around the base of the oil palms so that any ripe fruit that drops doesn’t get lost in the undergrowth. When smallholders want to replant, they seek assistance from the company to poison the old palms by direct trunk injection, drilling holes in to the palm trunk. The purpose of this is to desiccate the old palm and aid rapid composting. The large fronds rapidly collapse to allow direct sunlight through for the newly planted young seedlings to flourish and mature early. From left: Cornie Ruku - Manager, Rosa Ben, Lawrence Wakore, Mathew Kembu - Supervisor, Harry Kolate - Cutter and Daniel Wasayung - Trainee Assistant Manager. 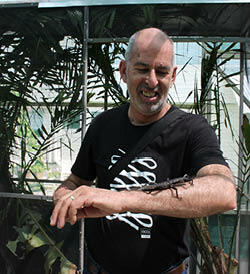 Malcolm Rands with a bunch of palm fruit. New Britain Palm Oil has over 70,000 hectares of oil palm plantations, the majority on state lease land (only 3% of all land in PNG is alienated). Given that State land is minimal the expansion over the past 15 years has been through a joint venture, whereby NBPOL partners with customary landowners to plant and operate agreed areas of land. This partnership has been very successful. Piles of harvested oil palm fruit lying on the side of the road, ready for pickup. Smallholder growers are made up of customary land owners or village oil palm growers, and settlers that came over in the early 1970’s as part of a Government initiative to expand agriculture. The smallholders make up approximately 32% of the production for NBPOL. The roadside bundles of oil palm fruit is collected by NBPOL, each net is weighed and recorded through a newly designed electronic identification system. A receipt is provided to the grower at the time of fruit collection. Growers are then paid fortnightly according to world market prices which are reset every month. NBPOL operate a total of 12 crude palm oil mills and 6 palm kernel mills. NBPOL processes 2 million tonnes of fresh fruit bunches annually. All processing mills have achieved certification against the RSPO standard. This certification covers all operations, including all smallholder growers. NBPOL are also Papua New Guinea’s leading commercial producer of high-quality beef. Rows of oil palms are planted further apart to allow room for grazing between the rows. When they’re not eating grass the cows are fed waste products from the nearby mills. Waste material from the factory is also bio digested to produce methane which is then used to fuel a turbine which can be used to generate energy for both operations and the local power grid. Spent oil palm fruit ready for composting. Empty fruit bunches are composted and the compost is then used as potting mix for the oil palm nursery bags or put back into the rows between the palms to rot down and add nutrients to the soil. Left: Sander van der Elsen is the Sustainability Manager from NBPOL and brings many years’ experience of working for various NGOs. Right: Like carrots, the orange-coloured oil palm fruit is naturally full of beta carotene. Harry and his wife Nancy are patrons of a group called Women Empowering Women (WEW), run by women from the executive ranks of NBPO. WEW are responsible for generating a gender rights policy, as well as establishing grievance procedures for sexual harassment and assisting in situations of domestic violence. WEW helps women find out what rights they have and where they can get help. We spent a couple of hours with the chairperson and public relations officer for WEW, Lilian Holland and Diane Mirio. As Lilian says, their goal is to ‘promote peace and harmony because you can’t be functional at work if your home life is not good’. WEW carried out fundraising to buy life sustaining equipment for the local hospital in 2014 and the establishment of a safe house for women and their families is one of their next goals. As well as being the chairperson of WEW Lilian is also the Senior Lands Officer for NBPO and Diane is also the Community Engagement and Development officer for NBPO. They are the ones to see if people are interested in establishing partnerships with NBPOL to develop their land. They facilitate the transition and ascertain how much of the designated area needs to be left for village gardens for food production. 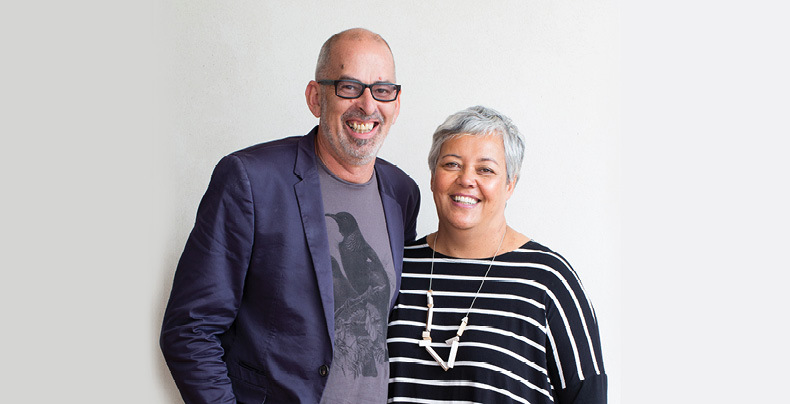 Malcolm and Melanie Rands, ecostore co-founders. Malcolm and I were more than satisfied that NBPOL is meeting all sustainability criteria related to the social and environmental impacts of producing palm oil. Our visit to New Britain has been very reassuring and given us confidence to move ahead with our future partnership. Algae-derived oils could one day replace palm derived oils for fuel, surfactants, soaps and packaging. It requires a small land use footprint, for example the US would only require 0.42% of its entire land mass to produce algae oils to provide enough fuel for the entire country. (1) Algae can be grown in most locations around the world as long as water is available. Some of the first samples of soaps made with plant oils derived from Algae have arrived at our Auckland laboratory. Investigations and testing are underway into this new feedstock which may replace palm oil-derived ingredients one day.